Constipation is a very common digestive issue and about 22% of Indian population suffer from it. If you are one of them, try these simple ayurvedic remedies to get rid of this annoying problem. Triphala is helpful in releasing out the harmful toxins from the body and improves digestion, hence, is great remedy for constipation. The juice of aloe vera plant is a rich source of magnesium which is beneficial since low levels are correlated with constipation. Taking one teaspoon of ghee with a cup of hot milk is an ayurvedic remedy to get relief from constipation and maintain healthy digestion. The leaves and pods of senna plant are potent laxatives and help induce bowel movement which prevents constipation. 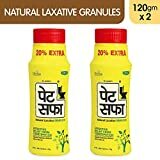 Pet Saffa granules are infused with the goodness of ayurvedic herbs and give effective relief from constipation & its other related problems. If you liked reading this article – “Ayurvedic Remedies Which Helps you to Get Relief From Constipation”, do like it and share with others. You can share your views with us in the comment box below.